Many people are surprised to learn intuition is a skill that can be developed - it is not something you have to be naturally gifted at. Most of us use our intuition every single day - we simply aren't always aware that we are even using it! Intuition is defined as the ability to understand something immediately, without being able to rationally explain why or how - it's as if we know almost instinctively or based on a hunch. Your intuition, sometimes also known as that "inner voice", "gut feeling", "wise mind" or "higher self" - can be a powerful tool in guiding us through a greater awareness in our lives. You have a bad feeling pulling into a parking lot of a convenience store, so you lock your car doors and drive away. You read on the news the next day the store was robbed around the same time you would have been inside. You *just know* who is calling you when the phone rings. A stranger appears at your door selling something and you do not let them in. You later learn this person was a scam artist. You have a hunch to have your furnace inspected. You didn't think anything would be wrong with it, but you find out from the repair person that it needs repairs to prevent leaking carbon monoxide into your home. All of these are examples of our intuition at work. There is no obvious logic to why we have a feeling about something - but in almost all cases we end up being very glad we listened to that inner voice nagging us gently into action. In the past, intuition was thought of as some "magic superpower" that only certain people could access. Fortunately, that is not really the case. Science is always researching things like intuition and consciousness, and they have made a lot of interesting discoveries in recent years - intuition is not just for those who are spiritually gifted! All of us have the ability to develop our intuition. Even if you don't feel like you have a drop of intuition in your body or mind - you can find ways to encompass intuition in your life. All you need is the desire to learn how. The benefits of using intuition are many. Using intuition doesn't mean you have to become a professional psychic and start predicting the future for others. You don't have to become the stereotypical spiritual woo-woo person to tap into your own inner wisdom! Improve Your Self Confidence: Do you sometimes question your ability or feelings about something? Learning to trust yourself and your own inner wisdom can help you improve your self confidence. Make Decisions More Easily: If you often feel unsure or indecisive in your life, listening to your own inner voice can help you make decisions easier. Intuition in Relationships: How many times have you met a person and had a bad or good feeling about that person? Often times, listening to our intuition can help us with relationships with others. This could be a romantic interest or partner, a family member, friend, or even when vetting who you do business with. Intuition in Your Career: Do you sometimes wonder how you can get ahead in your career, or do you sometimes feel unfulfilled by your work? Your intuition can help you get on the right career path to doing something you love and enjoy. Intuition in Healing Mind, Body, and Soul: Many times, learning to listen to our own body can help us get on a path to wellness. Learning to cook and eat intuitively can help one make improvements in diet and give your body what it needs. Listening to our intuition can also help us make important decisions on what is best for our physical, mental, emotional, and spiritual health. The possibilities for ways you can use your own intuitive abilities to help improve your own life and the life of others is endless! 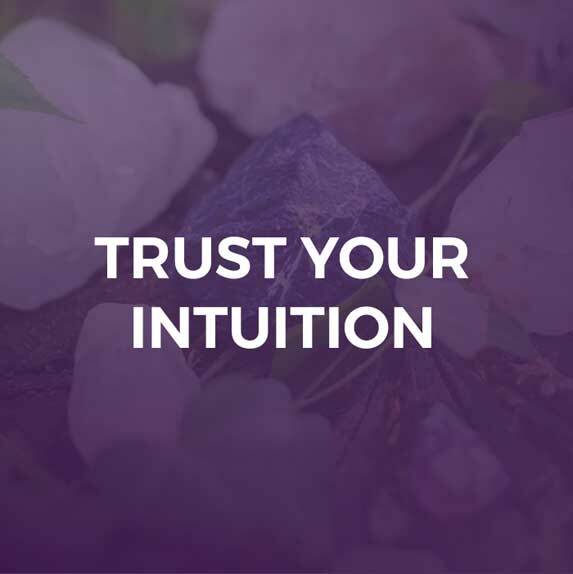 Now that we know why it's such a good idea to learn how to trust our own inner wisdom, let's talk about some of the things you can start doing today to improve your intuition! While you don't have to do all of the things on this list, you are likely to find that there are many things that are easy enough for you to start doing today! Intuitive people observe their surroundings all the time. They are mindful of who is around them, what thoughts and feelings they are experiencing, and are fully immersed in the present moment as often as possible. This gives them the ability to sense these "hunches" when they occur. Being present in the moment is a great way to learn how to develop and trust your intuition. A journal is a wonderful way to keep track of your thoughts and feelings. Often times we will find that when we write something in a journal and look back at it later we have written something that applies to events that happened later. If you have a gut feeling about something, take notes as to the situation, how it made you feel, and why you think your intuition might have been working in that situation. Expert opinions have their place, such as perhaps consulting with a medical doctor when you are sick. However, for the most part you need to practice relying on your own judgment. If you find yourself researching a topic for months before making a decision or if you have to ask family members or friends to decide what to do, this is a sign that you are relying too much on the opinions of others than your own guidance. When you learn to trust your intuition, you will find yourself feeling a lot more self-confident and comfortable with making decisions and going through challenges in life. Meditation is an easy way to help you clear your mind from thoughts and feelings that might clutter up your true feelings. Meditation is a way to give our brains a much needed break from all the things it is busy thinking about each day. Spending some time each day meditating can help you have better clarity, and help you feel more relaxed. Imagine a blank piece of paper in front of you. How do you know what to draw? Your intuition can be a wonderful muse and source of inspiration. It's also a great way to see your intuition at play when you give yourself the creative freedom to make anything you feel guided to do! You can paint, draw, sculpt, make music, whatever medium you enjoy. Worse case scenario: you'll never be a professional artist. Best case scenario: You will have a lot of fun and you will understand just how intuitive the creative process can be! A dream journal is a great way to understand your intuition in greater depth. Learning how to record your dreams and how to interpret what they mean can give you a lot of insight into different areas of your life. When developing your intuition, it's important to discern intuition from fears and anxieties. If you are always afraid of flying for example, of course you are going to have a bad feeling about getting on an airplane. This does not mean the plane will crash! However, if you fly all the time and really enjoy traveling, and then one day have a feeling you should not get on the plane, that might be a day to listen to your intuition. Just like our fears, wishful thinking can also be problematic. This is when you want to think something is going to turn out to be great. In these cases, it's not an intuitive message, it's just what you hope will happen. An example would be if you play the lottery every single day for three years and start thinking, "I can just feel it! I know today will be the day!" This is wishful thinking for a lot of people - something that is more intuition based would be if you NEVER play the lottery and don't like the lottery and suddenly there are a million signs in your life to play and a deep knowing you will win. Synchronicity happens when you see a lot of signs in your waking life that point you in the right direction. This is often believed to be messages from spirit or our guides to help us know we're on the right track. One example of a synchronicity is if you start to see recurring symbols in your waking life over and over again. For example, maybe you start seeing a horse everywhere. You are in a park and notice people riding horses. You turn on the TV and it is a movie about horses. You are researching something completely unrelated to horses online and you see a horse is part of the website's logo. You visit a museum to notice they suddenly have a whole new display dedicated to horses. These kinds of signs are ones to pay attention to! It's your intuition that recognizes these patterns to nudge you in understanding the symbolism of a horse. One thing that can help you learn to better sense your intuition and what it feels like is to sit with a deck of cards. Make a guess: Will it be a red card or a black card? Keep doing this until you can accurately guess which cards are which. You will be surprised that most of the times your first thought is "red" or "black" and notice when your logic tries to step in and tell you the opposite! One of the ways I tap into my own inner wisdom is to write letters to my higher self. I will start by writing a simple prompt on the top of the page: "What do I need to know today?" - and then a letter to myself. Often times this helps me better understand my fears and worries - and get on the right path to doing the things that make the most sense in my life. Don't think about what you write - simply allow whatever words that flow to you naturally to spill onto the page. Physics tells us everything is made of energy and that energy cannot be created nor destroyed. We can often sense energy all around us if we pay attention to it. Practice sensing energy by slowly waving your hands near, over, and away from an object. Good things to work with at first are things like running water or plants and trees. Pay attention to what feelings, sensations and thoughts occur. Can you sense a difference in the energy as you move your hands closer and away? Psychometry is the ability to know or sense information about someone when you hold an object that belongs or once belonged to them. This is possible because often times these things contain a psychic imprint and residual energy of the person. Common objects such as jewelry, a watch, or even photographs can all be sources for you to practice learning how to see and sense these imprints with your intuition rather than by what you might see. Looking to do a little exploring? Your intuition can be very powerful when it comes to traveling or even a "staycation" to explore places near where you already live. If there has ever been a place you have always felt a calling to visit, now is as good as any time to explore it. Whether hiking on a trail in a National Park or spending an afternoon in a nearby town or city - there are a lot of opportunities to notice your intuition at work. For example, if visiting a nearby town, use your intuition to decide which shops you want to visit or where you want to stop for a bite to eat. If you feel guided to take the backroads to get there instead of a more direct route, try the road less traveled - there may be a reason you feel guided to do so. Those who have a hard time meditating while sitting or laying down may find that a walking meditation can give them all the same benefits. While taking a walk in a familiar place, such as a nearby park or even in your own yard or neighborhood, spend time focusing on your steps and your breath while walking. If other thoughts or ideas come into your mind while walking, simply acknowledge them and continue to bring your attention back to the activity of walking. Doing this will help you feel grounded, centered, and calm. Many hobbies which are repetitive can be considered meditative. For example, Zentangle is a practice of meditative drawing. You may decide to build your own meditative rock and sand garden, or maybe even take up a repetitive hobby such as crochet or knitting. The key to what makes these hobbies meditative is that they have a lot of repetition. This repetition gives your "worry mind" something to focus on, so that you can enjoy the benefits of feeling peaceful and in the present moment. Intuition is often dubbed "the sixth sense" - and so it makes sense to develop your intuition, it is helpful to learn how to fully use and understand all of the senses! One way to start learning how to "tune in" to different things is to do so with your ears. You can find that you can often focus your attention on one sound, without necessarily hearing other sounds. Our intuition works the same way, so doing this with your ears first is a good way to get in the practice. Take a moment to close your eyes and focus only on what you hear. Maybe it's your neighbors talking next door, or maybe you hear traffic on the street nearby or even birds chirping. Focus on only one sound at a time. For example, currently I can hear my hands typing on the keyboard if I pay attention to what I can hear - though I did not notice that at all the first 2,482 words of writing this article! I call this one smell-o-vision because many people have always joked about how they wish they could smell something on TV. However, you don't have to be anywhere near something to imagine a strong smell of something! Take a moment and close your eyes and think of these common smells. You may be able to easily "smell" these things, even though you don't have a fresh bowl of popcorn in front of you. If you aren't quite able to do this yet, another thing you can try to do is tune your note to be able to turn on and off in order to smell different things. Notice how if you open the spice cabinet, you can "tune" your nose to smell different scents, such as cinnamon vs. garlic. While I can't prove it of course, I often think that spirit communicates with us through songs on the radio. This can be the radio you listen to in your car, or even a favorite playlist on a music streaming service. Often times when there is something I am looking to understand more, I will turn on a favorite playlist and listen to the songs that come on. Sometimes the songs are a perfect synchronicity to what might be going on with my mind. You may also notice spirit radio whenever you are out at places. Maybe a song comes on in perfect synchronicity as you are looking at items on a shelf while grocery shopping that helps you decide what item to buy for your health. You never know! One of the best ways to start trusting your intuitive abilities more in the beginning is to partner with a friend or group and practice different exercise. It can be very helpful to see when someone else is able to pick up on the same things as you! Our moods often can change, especially when they are sensitive to the different energies around us! Something that is very helpful for me is keeping track of my different moods each day using a simple mood chart. A mood chart makes it very easy to understand what external events and internal thoughts may be affecting your overall mood. Often times, you can go back and notice patterns and trends which will help strengthen your own intuition. Tarot and Oracle cards can be very helpful to understand more about a situation or help you explore and uncover your true feelings. They can also be very good tools to use to practice developing your intuition with! Rather than reading what all of the cards mean, take some time and look at the image. For example, if you draw the Ace of Swords card, look at the image carefully ad think about how it might apply to your life. We live in a world that is always busy - everyone is always doing something! If you feel like your schedule is always crammed and there's never time to do anything, then you may need to schedule some "Nothing Time". Taking some time to slow down, and do nothing is a great way to get back in touch with the wisdom of your own spirit. Even if it is just for 5 minutes a day, take a moment to be completely still. One way to instantly improve your mood is to practice gratitude. When we take some time to think about all the little things in our life that we are grateful for, it gives us a chance to bring positive things into our awareness. This act of bringing something into your conscious awareness is a great way to strengthen that "intuition muscle" we use to naturally bring things to the focus of our consciousness. Have you ever met a completely negative and toxic person? You know the type - the person who complains about everything, constantly demands your attention, and often leaves you feeling exhausted and drained just thinking about the person. Healthy boundaries allow you to focus on what matters most and brings you joy in life - and helps prevent these types of toxic people from cluttering up your own energy. Learning ways to set boundaries for people and situations that drain your energy can very much help you keep your own psychic energy clear. Most of us throughout the day will have little thoughts that out of nowhere pop into our mind. "I should call Sally" or "Pick up Milk on the way home" are just two examples of little things that might come out of nowhere. Write these things down, because often times they come for a reason. Sally might have some news to share with you, or you might have a passing thought to pick up milk on the way home - and then later than evening a large snowstorm hits or you find you have unexpected guests. These little random thoughts that happen can also be very helpful for creativity and business. You never know what one of these "random ideas" might lead to! There's a reason intuition is often associated with a "gut feeling" - it is because there are nerves in our stomach that have a reaction when a certain trigger occurs in the brain. Every part of our body is like this - so if you feel numbness, tingling, heaviness, or other physical sensations, it can be a good indication to pay attention to what is happening right now and how you feel. It can also be helpful to keep track of these sensations when they occur. Often times in looking back you will be able to see a pattern emerge. Many times foods such as alcohol, caffeine, and refined sugar can cloud or alter the way we think and feel. Highly processed foods full of artificial ingredients can also make us feel like we are dragging along in life. Making a few changes to your diet can often help quite a bit! Choose natural and all organic foods whenever available, and stick to whole foods such as vegetables and whole grain options. There are many herbs that can be used to induce a calm and relaxing mood that can make you feel calm and grounded. Chamomile tea for example is often used to relax and soothe. Using herbs to help you enter a relaxed state of consciousness can be useful at first - the important thing is to understand you do not always have to depend on these herbs to be successful! Intuitive collage is a process for self discovery where you use images cut out from books and magazines to create a picture that has meaning for you. It is a very fun and creative process that requires no artistic ability - and often you can find a great deal of wisdom based on whatever images you may choose. Humans have an energy field, and chakras are different points along the body. Most practices focus on the 7 main chakras, although many people embrace several more. Chakras have been used across a number of different cultures in ancient spiritual and medical practice. Keeping our energy balanced can help us live a well-balanced and healthy life - when our chakras are out of alignment, many times physical signs can appear. A simple guided mediation can be very helpful in balancing your chakras - you can also learn about each chakra and its meaning to help you learn how to listen to the energy of your own body. One of my favorite books is the book Creative Visualization by Shakti Gawain. This book helps you learn how to use the power of imagination and visualization to focus on creating the life you want. With creative visualization, you practice techniques of imagining things that can be helpful for you. For example, if you are feeling afraid, you may visualize a protective light surrounding you to ward off anything that might harm you. If you want to move, you might start practicing a few moments each day to visualize the perfect house in your mind. Many people have used creative visualization in alternative healing modalities and even as a tool for working through difficult emotions or trauma. How do we know what to imagine? Why, your intuition of course! Our intuition can take awhile to fully develop and trust - so it's important to practice daily if possible. With regular practice, you will start to very quickly and easily learn to recognize and trust your intuition at work! With patience, practice, and persistence, you will find you are able to use your intuition a lot more confidently in your life. The more you work with your intuition, the better you will be at knowing when to listen. 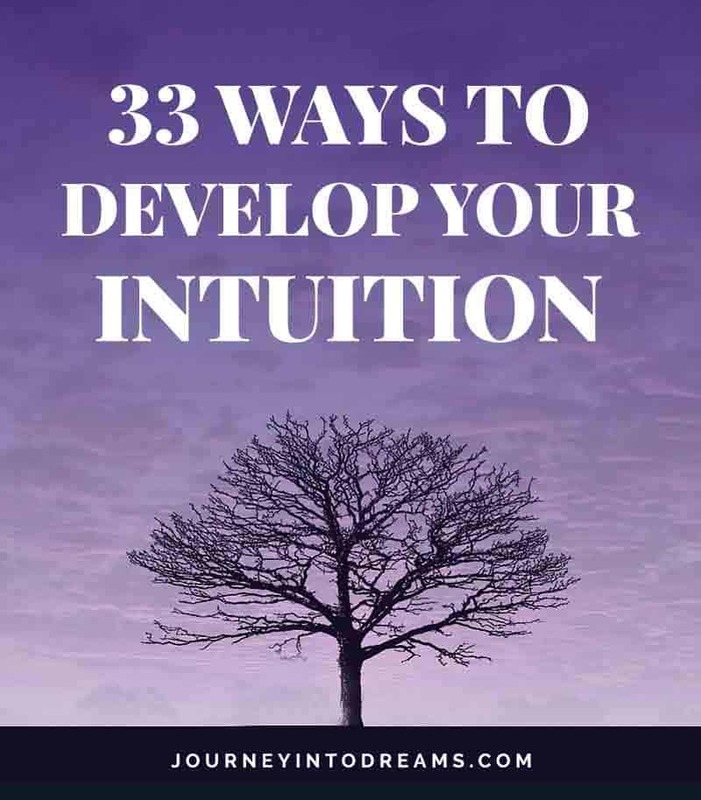 I hope you enjoy this list of ideas on ways to develop your intuition - and of course I want to hear your thoughts! Do you have any ideas for ways to develop and trust your own intuition? What are some of the things that helped you learn to listen to your own soul wisdom?